The year took off with some new translations of my books. It's three new ones in China! Petrel Publishing House issued THE DOVE THAT COULDN'T DIVE (DE DUIF DIE NIET KON DUIKEN), my book with Alain Verster, ONE MILLION BUTTERFLIES (EEN MILJOEN VLINDERS), with Carll Cneut, and GOODNIGHT EVERYBODY (WELTERUSTEN IEDEREEN), with Sebastiaan Van Doninck. All three books were originally published by De Eenhoorn, in Belgium, and now translated by Sun Yuan. ONE MILLION BUTTERFLIES was previously released in Brazil, Portugal, Spain, Italy, France, Germany, Norway, Slovenia, Georgia, Taiwan and South-Africa. THE DOVE THAT COULDN'T DIVE in Germany, Norway, Denmark, Taiwan and rights were bought for Italian. GOODNIGHT EVERYBODY was also published in Taiwan. 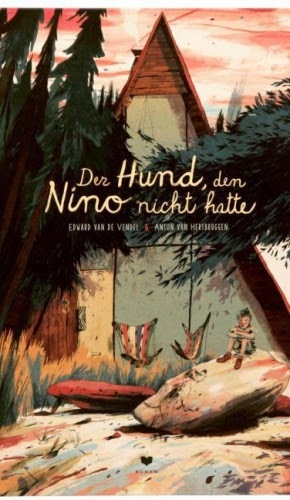 In Germany DER HUND, DEN NINO NICHT HATTE came out. It's Rolf Erdorfs translation for Bohem Press of HET HONDJE DAT NINO NIET HAD (THE DOG THAT NINO DIDN'T HAVE), which is already available in French and Danish, and will be published in China and the United States as well. I got to make this book with Anton Van Hertbruggen, and also this one was originally published by De Eenhoorn.